Kohler ®Generators is introducing a new 30 kW standby generator, designed for large homes and small businesses. The KOHLER 30RCL, which will quickly restore power following an outage, features a robust 1,800-rpm liquid-cooled KOHLER® engine and patented noise-reduction technology that keeps sound levels to a minimum. Designed for whole-house power, the 30RCL will keep major systems and appliances – including HVAC, lights, refrigerators, sump pumps and security systems – running in the event of a power outage. * It can also protect sensitive electronics, including smartphones, computers and entertainment systems, due to its outstanding voltage and frequency regulation as well as ultra-low levels of harmonic distortion. 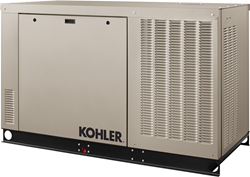 Kohler Generators – part of Kohler Power Systems – manufactures a complete line of automatic standby generators from 8 kW to 150 kW, which connect to the electrical system of a home or business and quickly restore power following an outage. For more information, visit http://www.kohlergenerators.com or http://www.facebook.com/kohlergenerators. Kohler Power Systems is a division of Kohler Co. and provides complete power systems, including generators (portable, residential, industrial, and marine), automatic transfer switches, switchgear, monitoring controls, and accessories for emergency, prime power and energy-management applications. Kohler Power Systems has delivered energy solutions for markets worldwide since 1920.